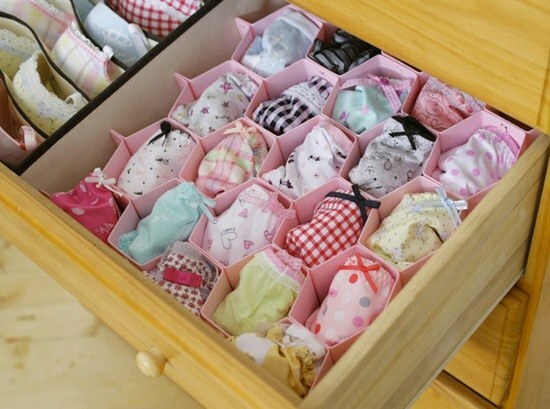 Organizer for underwear – an indispensable thing in the economy, allowing to contain the underwear drawer in the closet in perfect order. This organizer is easy to make your own hands and fit its dimensions exactly the place for linen storage. The easiest option of making organizer for linen is based on ready-made cardboard boxes. This will require a box, the size of which allows you to place it in the Cabinet drawer or in the place where underwear. The side walls of the box neatly pruned to the desired height, after which the next organizer inside and outside with beautiful paste paper for decoupage. From another box and cut a rectangular strip that will serve to create partitions. The number of strips depends on how many cells will contain the organizer. On details make the small cuts that need to connect walls to each other. To sustain the overall design style, partitions also paste paper for decoupage and reliability of the top is covered with a layer of lacquer. The septum is inserted into the organizer, if necessary, adorned with decorative elements. If the organizer will be placed on the open shelves, it can be dressed up stitching together cover fabric instead of wrapping paper. For the selected fabric draw a rectangle, the dimensions of which allow you to close the bottom and sides of the box from the outside. Exactly the same make and inner case organizer and its partitions, and the fabric can be the same color as on the external cover and contrasting colors. On the organizer first, pull the outer cover, then the inner and set partitions. The upper edge of the inner cover is treated with a decorative seam or decorative braid and folded over the outer cover. The finished product is decorated with ribbons, bows, flowers, fabric, beads. Very original and looks spectacular organizer for underwear, made in the form of hexagons-honeycombs. For the manufacture of such a container will need a plastic card the same size and thick paper. If you do not have used plastic cards, replace them with cardboard pieces, cut to template. To make a smooth and neat honeycomb, cut a strip of paper, the size of which allows you to fold it up and tuck inside, the resulting strips of six cards. The cards should be laid with a distance of about 2-3 mm and be fixed with a drop of glue. In this paper band should stay with the bottom edges of the small stock to the paper was slightly bent – so the finished cell will stick to the bottom. For the bottom you need to prepare a cardboard hexagons. The strip with the cards stacked in the form of a hexagonal honeycomb, round the contour, thus obtaining a template for making DNA cells. Have formed honeycomb coat with glue folded bottom edge, glued the bottom, and then glued together side walls of the cells. To make the construction of reliability, you can stick it on a thick sheet of cardboard. The finished organizer is decorated with ribbons, lace, and bows.